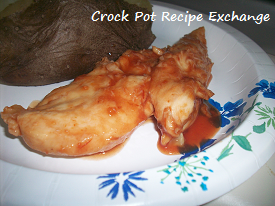 I use chicken breasts often in crock pot cooking and figured that it would be easy to use the chicken tenderloins in recipes too. As suspected, I had to watch the cook time carefully. 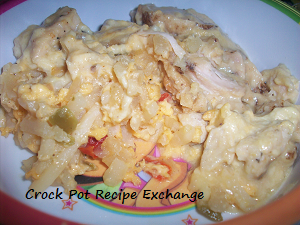 Since they are a lean cut of meat the portions are much smaller they cooked in the crock pot on low very quickly. These were a huge hit because they kind of resembled the flavors you find in Manwich. When the hubs walked in the door he smelled them and had thought I cooked manwiches for supper. He wasn’t disappointed once he tasted these chicken tenders. In a 2 1/2 quart to 3 quart crock pot pour 1/3 of the bottle of chili sauce in the bottom of the pot. Drizzle a tablespoon of honey over it. Add 1/2 of the chicken tenderloins in an even layer. Pour another third of the chili sauce over that layer of the chicken tenderloins and drizzle with another couple of tablespoons of honey. 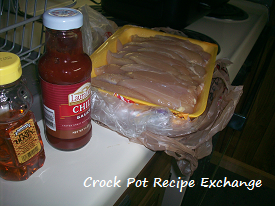 Add the rest of the chicken tenderloins and cover with the remaining chili sauce and honey. Place a lid on and cook on low for 2 – 3 hours or until the chicken tenderloins are cooked all the way through. 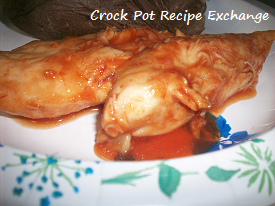 If the sauce is a little watery you can remove the lid and turn the crock pot to high for 30 minutes to an hour. This will let the sauce thicken and reduce.